Pina Bausch has left her imprint both visibly and invisibly on many contemporary choreographers including Jasmin Vardimon, whose London-based troupe Jasmin Vardimon Company makes its American debut (if you don’t count a blink-of-an-eye stint in Texas) at Peak Performances with “Freedom” (definitely an American premiere), April 18-21. 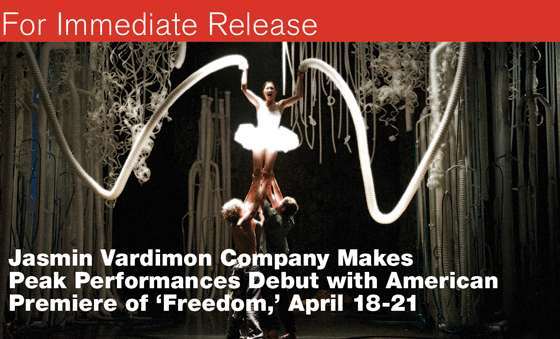 “Freedom,” which received its world premiere at Sadler’s Wells in London, where Vardimon is an associate artist, questions the notion of “freedom” itself. What does it mean? How does it relate to its opposite: imprisonment? The dance asks these questions through a series of enchanting tableaux that include dancing fireflies, wolves in yoga pants, plants that transform into snakes, a surfer who mistakes his girlfriend’s body for a surf board, a ballerina who initially mistakes industrial tubing for wings and a swan with an attitude–and altitude–problem. It is surreal, whimsical, nightmarish, witty and fun. Vardimon also serves as the work’s sound designer. Charter bus service is provided from New York City’s Port Authority Bus Terminal – arcade on 41st Street between 8th and 9th Avenues – to the Alexander Kasser Theater ($10 per person, roundtrip) for all Saturday and Sunday performances. Bus reservations may be made by calling 973-655- 5112 or by visiting www.peakperfs.org. For train service, available only on weekdays, go online to www.njtransit.com or call 973-275-5555. JASMIN VARDIMON (ARTISTIC DIRECTOR), who was born and raised on a Kibbutz in central Israel, joined the Kibbutz Dance Company, and in 1995 won a British Council ‘On the Way to London’ Choreography Award. She moved to London in 1997 where she founded Jasmin Vardimon Company (previously Zbang). She has been an associate artist at Sadler’s Wells since 2006. Previously, she was an associate artist at The Place in 1998 and a Yorkshire Dance Partner from 1999–2005. Works for her company include “7734,” “Yesterday,” “Justitia,” “Park,” “Lullaby,” “Ticklish,” “LureLureLure,” “Tête,” “Madame Made” and “Therapist.” “Lullaby” was selected for the BBC documentary Dance Film Academy featuring the development of a film version of the piece (2005). She has received choreographic commissions from the Royal Opera House (“Tannhäuser,” Dec 2010) and (New Opera composed by Graham Fitkin 2012), Hellenic Dance Athens, CandoCo, WID, Bare Bones, Transitions, and she curated the “Dance Ballads Festival” at the Oval House. She recently developed a Higher Education program for dancers and actors, run by her company as a Post-Graduate Diploma at Royal Holloway University London. She is the recipient of numerous awards including the prestigious Jerwood Choreography Award (2000); the Jerwood Foundation’s ‘Changing Stages’ Award (2004); a nomination for Best Female Artist at the Critics’ Circle National Dance Awards (2003); The London Arts Board ‘New Choreographers’ Award (1998); The Colette Littman Scholarship Award (1997); The Havatzeleth Foundation Scholarship (1997 & 1995); and the America-Israel Foundation Choreography Scholarship (1989 & 1991). She has been a Visiting Professor at the University of Wolverhampton since September 2011. The 2012/13 season is made possible in part by funds from: Association of Performing Arts Presenters; the National Endowment for the Arts; the New Jersey State Council on the Arts/Department of State, a Partner Agency of the National Endowment for the Arts; Discover Jersey Arts; the Mid Atlantic Arts Foundation; Alison and James T. Cirenza; and The Honorable Mary Mochary.